Lentiq is the data science environment that brings your projects to life. Have a small team? We've got your back! No more unfinished business. We know how frustrating it is. With Lentiq, your team, no matter how small, has the support it needs to see projects all the way through, from idea to implementation. Packed with essential features, Lentiq helps you build a multi-cloud, self-service data lake in just a few minutes. It’s easy and cost-efficient, enabling your data team to start working immediately. With Lentiq, all you need is a brilliant idea. Centralized, gigantic data lakes are overrated. We know it! You'll learn it! The standard, huge data lake has disadvantages. It’s hard to use for everybody in the team. Even if projects seem easy to start, they rarely get finished using this approach. As a response, we created the mini-data lake. These are inter-connected data pools working in the cloud of your choice. With a mini-data lake, your team can collaborate, access notebooks, manage application stacks and data, share files, and write portable code that can be run as part of a workflow. Keep track of your data and know what's in each file. We know you want to! Lentiq features a super-powered table browser that lets your team stay organized. Free them from the hassle of identifying what each file contains by annotating tables, columns, and files with descriptions, comments, and tags. All files are clearly explained. Data is easy to discover and access. Most importantly, data is finally going to be used! We call this a cross-cloud, universal data catalog. Sounds cool, right? It's also useful! Your team will have the freedom to access and use data while you enjoy the much-needed standardization—a data-lake with a twist. Did you say team-work? We hear you! Say hello to your own, personal, global data store! What is a data science team without collaboration? Mostly, it’s a group of humans working in vain. Avoid this fate by using Lentiq's file sharing capabilities. We believe that projects work best when teams unite, so we built you a unique publish/subscribe mechanism. 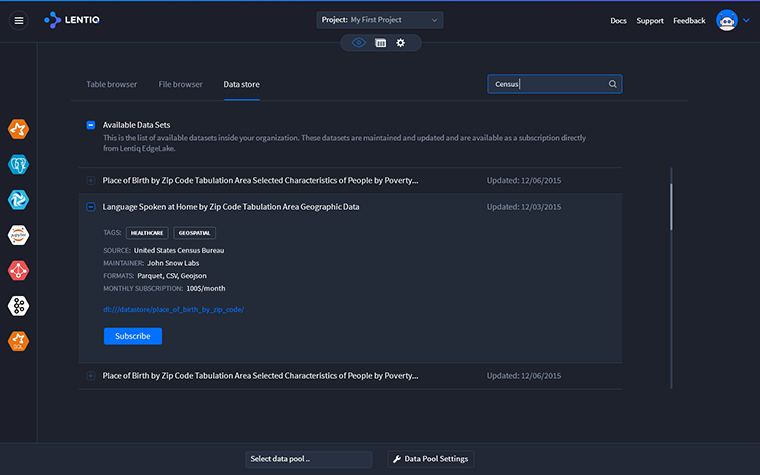 With this feature, you can share curated datasets internally. What do you get? A happy team, increased communication, data quality and time to play some fancy PS4 game. Yes, we get it. Code portability? It's a thing! Every team should be able to share data and code across clouds easily, without spending time adapting it to various environments. Discover the usefulness of data and code portability with Lentiq—avoid reinventing the wheel every single time. Our portability mechanisms act as an abstraction layer and enable the code to run anywhere either on a standalone basis or as part of a schedulable workflow.